Your shell kit speaks volumes about your dedication to drumming, but your cymbals are symbols of neglect. Time to change that tune, and the folks at TRX Cymbals have a couple of suggestions they'd like to make. The new TRX LTD Series kicks off with the 18˝ and 20˝ Crash-Ride models and matching 14˝ hi-hats, both designed to offer drummers several improvements over the sound and performance of previously available cymbals. The LTD Series employs three types of finishing processes to enhance the two types of sounds that are characteristic of the popular, dual-purpose cymbals. During the course of their ongoing research into cymbal performance, TRX cymbalsmiths recognized that modifying the three main areas of a cymbal - the edge, bell and face & mash - greatly impacted the acoustical output. By developing a unique combination of manufacturing methods that optimize each zone's sonic impact, they were able to create the LTD Series. The outer edge of LTD Crash-Ride cymbals features a heavily polished finish that is purported to add more brightness and explosiveness to the crash component of the sound, while the bell of the cymbal has a natural finish to increase the definition and articulation of the ride sound. To maintain a balance between the LTD's clarity and power and its overall warmth and full-frequency tonal spectrum, the main playing surface has a more traditional lathed and hand-hammered finish. In the case of the hi-hats, this "three-zone" approach provides a cleaner, crisper stick and foot sound plus more volatile open and half-open effects. Slightly heavier than TRX MDM (Medium) Series to further enhance their projection and durability, TRX LTD line is recommended for a variety of contemporary playing situations. The cymbals are sold individually but are also available in an exclusive Crash-Ride Combo Pack, which includes an 18˝ and 20˝ Crash-Ride, 14˝ Hi-Hats and a free TRX deluxe cymbal bag - while supplies last. Personally, we love shiny new cymbals - that way, we can see ourselves when we play. 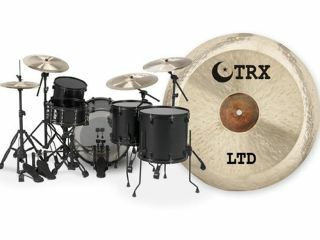 For more information, visit the official TRX Cymbal Company website.